1. I'm not trying to look like someone punched me in the face- this is the result I have obtained anytime I have tried to wear the stuff. Recently I've been a bit bored with all the lip products I seem to have acquired and really wanted to step up my makeup. Aside from contouring, this is the main thing I have never been able to master so I decided to get some eyeshadow and start practicing! 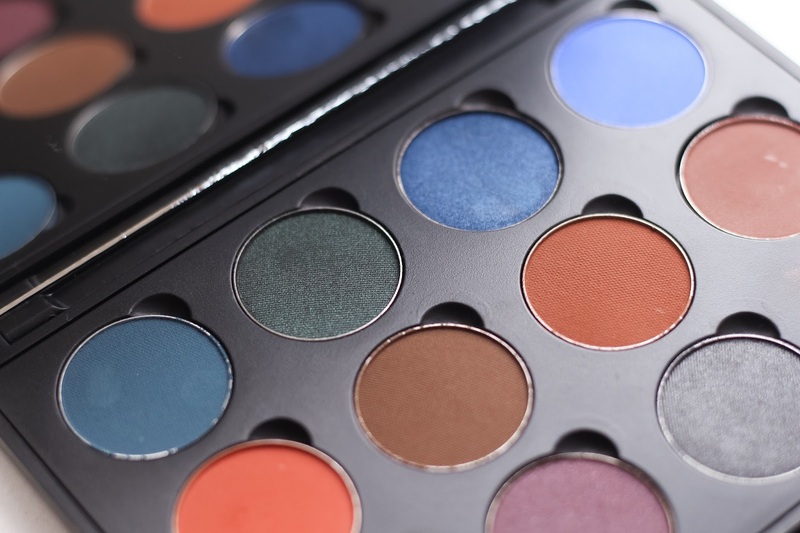 I did a lot of research into palettes for 'beginners' etc and a few people recommended the Warm or Cool neutrals palette from Mac, the Morphe 35 palettes and Sleek I-Divine palettes . In the end I decided to make my own palette with colours that I actually liked. Don't get me wrong, the ready made palettes can be very cost effective and I have since bought a few but I just kept thinking I wouldn't wear all the colours so it seemed a little excessive. As I mentioned, I did a lot of research before buying the shades that went into this palette. I watched so many YouTube videos.. (Shout out to The Fancy Faced, Jackie Aina, Nikkie Tutorials), googled swatches and asked for recommendations. Many people I spoke to recommended Makeup Geek and Mac for the best shadows in terms of pigmentation. I started looking for Makeup Geek shadows on Ebay but Beauty Bay started selling them which made them much easier to get hold of! 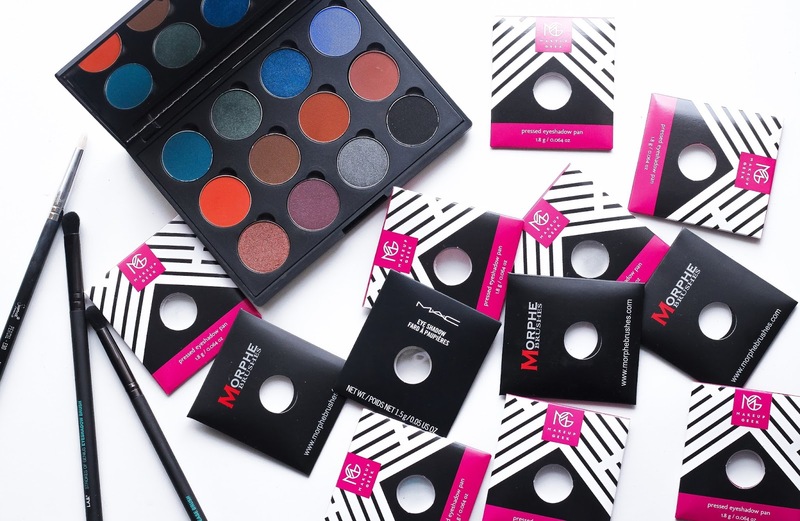 The palette is mainly comprised of Makeup Geek and Morphe pans with one pan from Mac. I also bought an empty magnetised Morphe palette as a cheaper alternative to a Mac palette. Unlike the common Z palettes used to house Makeup Geek shadows it has a mirror and is a little more sturdy in my opinion. 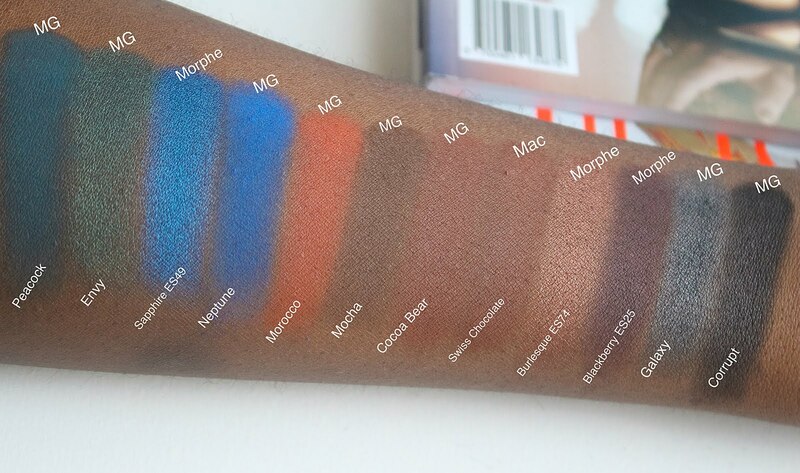 All in all, I was looking for Mac dupes, I swatched quite a few Mac shadows in store and I knew which ones I wanted, mainly Red brick, Swiss Chocolate, Carbon, Antiqued and Atlantic blue but I was not about to pay the Mac price so I searched for Makeup Geek and Morphe shades that were really similar. 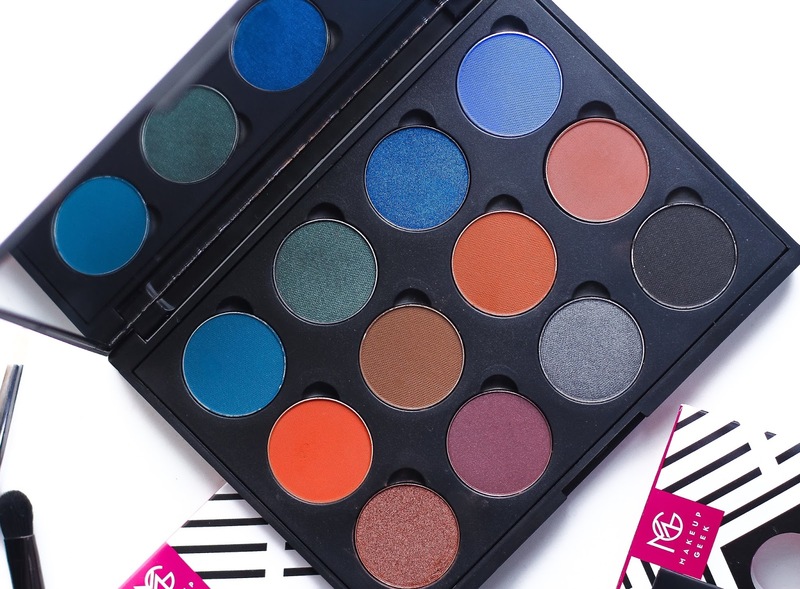 First of all I must say that all the shades are super pigmented, the Makeup Geek shades a little more so than the Morphe ones but they all still pack a punch. Most of the shades are super smooth and easy to apply. I experience some fall out with them, particularly with Corrupt and Peacock, however it isn't not too much of a hassle to wipe away. With a primer these stay on my eyelid for the whole day, even though I always forget I'm wearing eyeshadow and rub my eyes! We all know I do not know anything technical about eyeshadow so I can't really say much more! This row was definitely the experimental row! I have seen some amazing looks created with Mac Atlantic Blue so I knew I had to get Neptune. It really packs a punch, so bright and shocking! It applies very smoothly and looks great smudged along the waterline. I found Peacock to be a bit powdery but it is still a lovely matte shade that becomes more workable with a primer. Envy and Sapphire are lovely frost shades- perfect for night looks. Envy reminds me of Christmas, the shimmer is not too excessive and I can imagine it looking amazing with a little glitter on top! Sapphire is super smooth and very vibrant -I think it pairs really well with Neptune. After hearing many Youtube MUA's talk about the importance of transition shades I knew I needed to include some great ones in my palette. 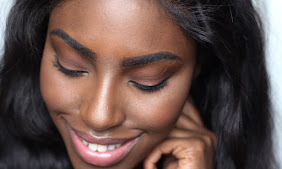 A few MUA's who are of a similar skin tone to me used Red Brick and Swiss Chocolate a lot as transition shades particularly when creating smokey eyes. Morocco is pretty much identical to Red Brick but I couldn't find anything that looked like Swiss Chocolate. I just went ahead and purchased Swiss Chocolate and I don't regret it! It is smooth and blends really easily, it also matches my skin tone really well so I find it great to give my lids an even tone as well as using it as a general transition shade. Annoyingly it isn't magnetic so I have to be really careful when opening the palette because it has fallen out a few times! Mocha and Cocoa Bear are both described as reddish brown but I think Cocoa Bear is more fitting to the description. Cocoa Bear is a great crease shade particularly for a brown smokey eye but I find it works well for blending Swiss Chocolate with a black shadow for a dramatic smokey eye. I haven't quite figured out how to use Mocha correctly! I find it a little chalky but I imagine it can be built up for added depth to your crease. This row has my favourite colours! Burlesque is so pretty- it applies very smoothly and it's the one I have used the most so far! If you love warm neutrals this is a great shade, the shimmer is perfect. Since purchasing these I have also bought one of the Mac x 9 palettes in Burgundy which has Antiqued in it and the shades are basically identical! Blackberry is a little powdery but still quite pigmented, like Peacock above it is more workable with a good primer. I got Corrupt because the common feature of most palettes is a matte black shade and as it is more intense than Carbon I figured it was a great investment. There's quite a bit of fall out with Corrupt but it's not too annoying to wipe away. Galaxy is gorgeous! Amazing colour pay off and applies smoothly. 2. Primer! The eyeshadow kept creasing :'( I recently bought the Urban Decay Primer potion which has made a big difference. 3. Brushes! I need to invest in a good full set of eyebrushes if I want this to work for me. I have been using the amazing Sigma E30 pencil brush a lot and some brushes I was gifted from L.A.B.2* at a recent Bloggers Hangout event but I would love a complete set. What set would you recommend?? *Disclosure - Any items marked with an asterix (*) are either PR samples/gifts. All the opinions written about the products are my own. Not sponsored. This palette has the most gorgeous range of colours. I often find it difficult to get such bright colours as this. You're amazing at makeup- much better than me. Great post! I am new to Makeup Geek eyeshadows, but they are already some of my favorites. This post gave me some inspiration on what colors I want to add to my collection. =) I think you are already great at makeup based on these pictures. And your eyes are gorgeous! Making me want to start a new palette-*which I don't need*! It looks like you are going in the opposite direction to me. I was the eyeshadow girl back in the day. My first proper piece of makeup was a MAC eyeshadow and I fell in love. Dabbled with blush for a second then found every lipstick under the sun and never looked back. However Morrocco to Blackberry are winking at me! It all takes practice so I look forward to seeing your future looks. This is SUCH a good idea. Making your own palettes with eyeshadows you'll actually use instead of having tons of palettes with unused product! Can't wait to see your eyeshadow journey! Awesome post! My question is do you have a preference? Between makeup geek? Mac? 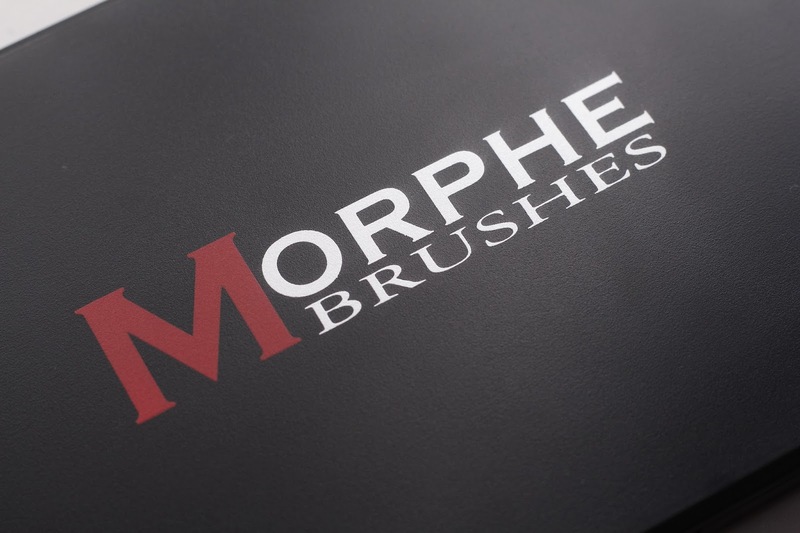 Morphe? Is one better? I'm debating now which route to go! !